The sacred task which Arthur must accomplish is to learn how to use the sword and more importantly when to use it. Discrimination comes with maturity, which the Puer never obtains. The sword can be used rightly to destroy illusion, as the sword is symbolic of cutting through falsehood to the truth. However, there are times when the sword must remain within the scabbard, as removing illusion would bring about worse consequences clothed in despair and bitterness. Again, the wisdom that divines truth from illusion is beyond the capability of the Puer. Kime contends that this wisdom involves comfort with ambiguity, and understanding the distinction between absolutism and relevance, as well as the ability to reconcile the human with the sacred. The sword should only be removed from the scabbard in times of real need as Merlin has advised. King Arthur, conversely, wages unrelenting war and kills wantonly, leading to cruelty and vengefulness. 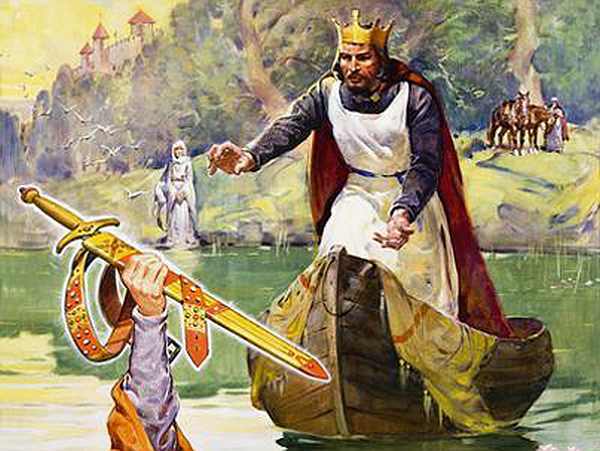 As Kime indicates, King Arthur exhibits the neurotic type of hero behavior, often bursting into action after missing signs and ignoring cues and advice so he is forced into desperate heroic action that could have been prevented. War is partly the history of the actualization of the use of weapons. Once we have the weapons, the desire to use them is strong and the ability to control the outcome suffers. Arthur cannot resist the hold Excalibur has over him and suffers as a result. 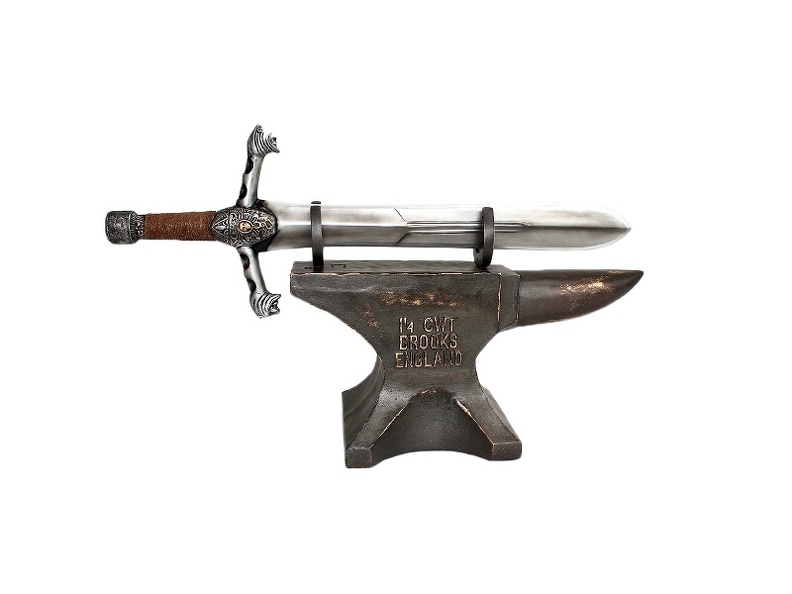 Arthur believes that Excalibur gives him the ultimate power over his destiny, however, the power lies within him to make use of both the sword and the scabbard as complementary opposites so that he may act with consistency and rule wisely. Since Arthur lacked the consciousness of understanding the sword’s use, it became a base tool to wield and conquer without direction. The use of the sword must be grounded in a more sacred purpose—the preservation of his people and the land. The thrill of battle soon disintegrated into misery and sadness through the misuse of this force unbalanced and ungrounded. The feminine component of use symbolized by the scabbard serves as a check on the sword’s use. The scabbard’s name in Arthurian legend is called “Memory of Blood,” a reference to the feminine aspect of birth and life— an instrument that must sheath a sword that sheds blood to ensure it will only be used justly and in times of real need. The sword may appear to cut through problems, solving them in a decisive manner, but its use without the understanding of the complementary purpose of the scabbard denotes a limited intelligence. A small mind fears and ridicules complex problems that would yield better results with patience and ongoing discussions. The grandiose display of bravado to heroically deal with a problem is rarely helpful or necessary. It is in the knowing of the sword’s power and potential when it is at rest in the scabbard that true strength can be measured, and a leader rules with a higher consciousness of wisdom rather than the primal energy of reactionary unconscious behavior. Potentiality is the key to understanding the power of the scabbard—the psychological feeling of strength derived from the knowledge of the swords availability and readiness for times of utmost necessity. In this way the sword, as a sacred magical Hallows, is held in veneration and not dissipated through every day banal use, thus maintaining the stature of the sword as a holy object. That being said, understanding the dynamic between the sword and the scabbard does not necessarily include the ability to discern the timing of its use. A clear example of the understanding of the power dynamic between the sword and the scabbard can be seen in a more modern context during the Cuban missile crisis of the early 1960s. The military generals advising President Kennedy wanted to bomb the missile silos in Cuba before the Soviet Union could deliver and activate nuclear missiles. President Kennedy overruled them and opted for a naval blockade instead to contain rather than escalate the crisis. The president also refused to acknowledge the war mongering bluster of the Soviet premier. He understood that a violent show of strength was unnecessary and could lead to an escalation of the crisis into World War Three. The knowledge and stature of the United States as a world power with nuclear capability was enough to head off the shipment of missiles by the Soviets. The understanding of the discriminant use of the sword and the power of the scabbard won the day at a fortuitous moment of time in our nation’s history. Finally, the sword is also given by the feminine aspect, the Lady of the Lake. Its true power transpires through the relationship between the feminine and masculine aspects (scabbard and sword) or in Qabalistic terms, the balancing relationship between form (feminine principle) and force (masculine principle) on the Tree of Life. 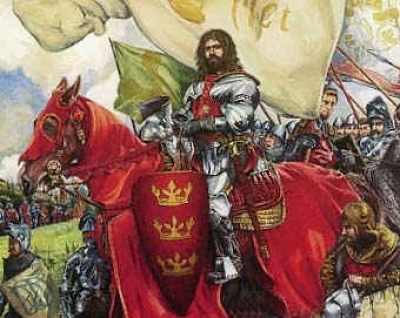 For the archetype of the Puer, which King Arthur embodies, the lesson is one of discrimination as to the use of the sword and the understanding of the value of the scabbard that holds the sword in readiness for the possibility of its use in moments of great need. The sword and the scabbard are therefore the symbolic embodiment of self-reflective action. The sacred warrior king’s great sacrifice was to be given the gift of a great, wondrous and powerful Hallows, but required to use it with wise restraint. This necessitated wisdom, maturity and strength far beyond the Puer man-child that was King Arthur. Day, David. (1995). The Search for King Arthur. Great Britain: De Agostini Editions Ltd.
Knight, Gareth. (1996). The Secret Tradition in Arthurian Legend. York Beach, Maine: Samuel Weiser, Inc.
Knight, Gareth. (2001). A Practical Guide to Qabalistic Symbolism. Boston, MA. : Red Wheel/Weiser, LLC. Kime, Philip. L. (2010). The Puer and the Symbolism of the Sword. Psychological Perspectives. 53(1), 43-61. Matthews, Caitlin. (1995). The Celtic Tradition. Rockport, MA: Element, Inc.